prudsys AG hosts leading conference on realtime personalization at nhow Berlin on June 27/28, 2017. Summary: 97 % satisfied participants at the prudsys personalization summit 2017. Besides the top-class conference program, highlights included presentation of the Personalization Award to Thalia as well as the prize ceremony for the winning teams of the DATA MINING CUP 2017 from Switzerland and China. 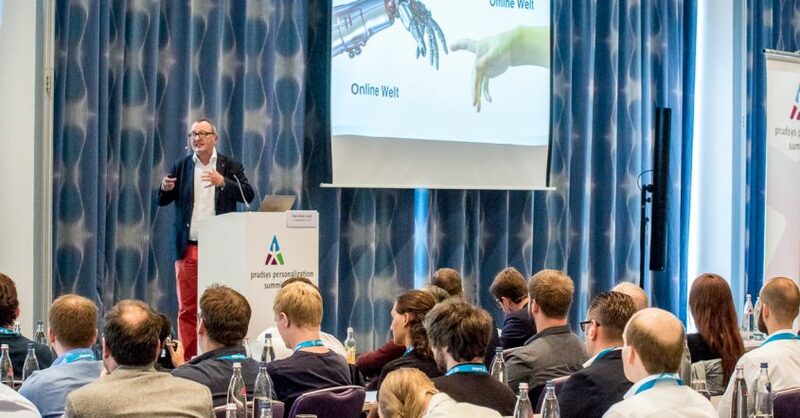 With record attendance and a recommendation rate of 97 %, over 200 guests dived into the world of omnichannel personalization on June 27 and 28 at the nhow Hotel in Berlin. The prudsys personalization summit (pps) was a diverse conference featuring lots of presentations, a panel discussion and a range of workshops under the motto “Retail Meets Machine Learning.” Machine Learning and artificial intelligence are becoming increasingly hot topics in retail: Besides the conference program, the pps provided space for a lively discussion about successfully-implemented business scenarios. The “Omnichannel Hub” was an on-site showroom offering the opportunity to try out innovative personalization examples. This year the “Personalization Award 2017” went to Thalia. The market leader in the German language bookselling industry has been working with prudsys since 2011 and presented its innovative online shop, newsletter, App and eReader usage scenarios. Another highlight of the event was the presentation of the DATA MINING CUP 2017: The best teams were awarded their prizes during the Get-Together Party. Students from the École polytechnique fédérale de Lausanne in Switzerland took first place. Second place was also secured by a Swiss team, this time from the Eidgenössische Technische Hochschule in Zürich. Students from Southeast University in China were placed third. Two hundred and two teams from fourty-eight countries took part in this world-famous competition for intelligent data analysis. The supporting program of this year’s pps included a boat trip on the River Spree, a table football tournament and the Get-Together Party on the first evening of the conference. It went down a treat with the participants.